← Day 24 – Frost! Day 25 – Look Who Came Calling! Who could the culprit be? About a month or so ago the ferret food started to disappear. Adding bungee cords to hold down the lid on the food dispenser didn’t help – the cords would be removed and the food gone each morning. At first we thought it might be the cats, but they aren’t strong or dexterous enough to break into our tied down ferret food hopper. 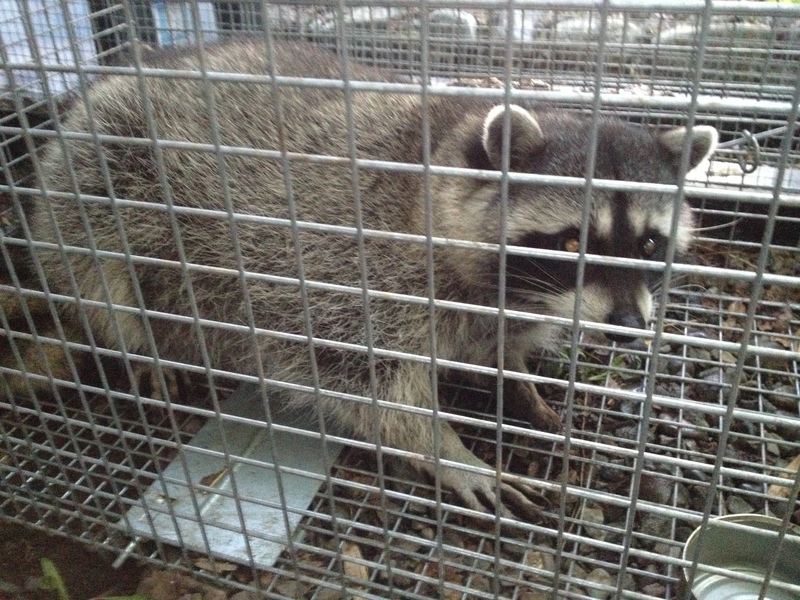 We got one of those live traps, thinking we might be dealing with a raccoon. 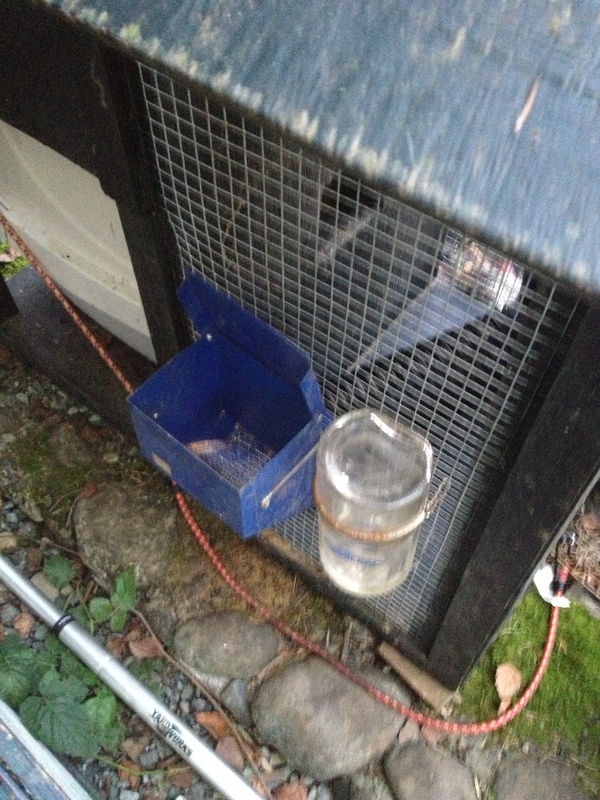 We put the trap beside the ferret cage and… nothing. The food stopped disappearing and the trap remained untouched. A couple of weeks later, we caught the neighbour’s cat. The cat was rather miffed that it had been busted stealing the cat food we had used as bait, but the ferret food remained untouched. 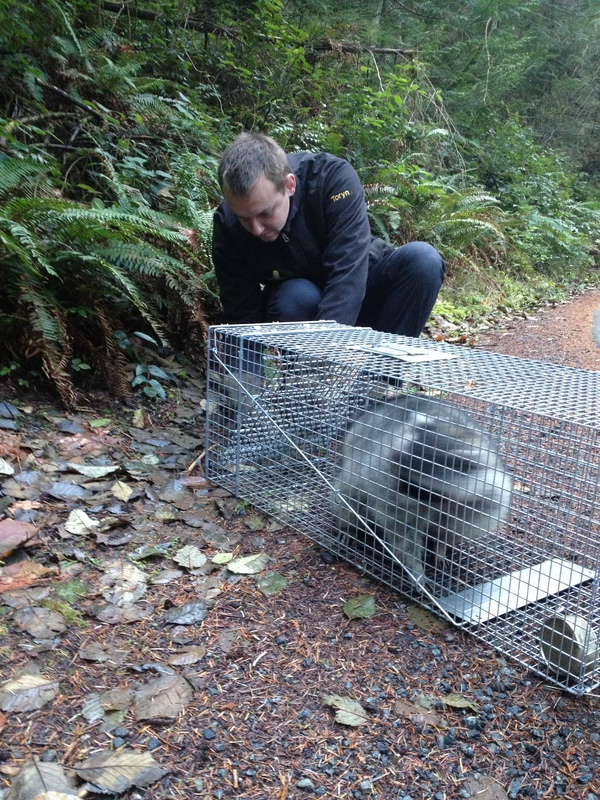 We speculated that maybe the raccoon had met with an untidy end up on the highway or had seen traps before and knew it was best to avoid our place. I know these devils eat chickens, kill turkeys and ducks, and generally have no respect for other people’s property, but my, oh my, they are adorable! This dude was FAT!! Totally rolly polly and surprisingly relaxed, given his circumstances. 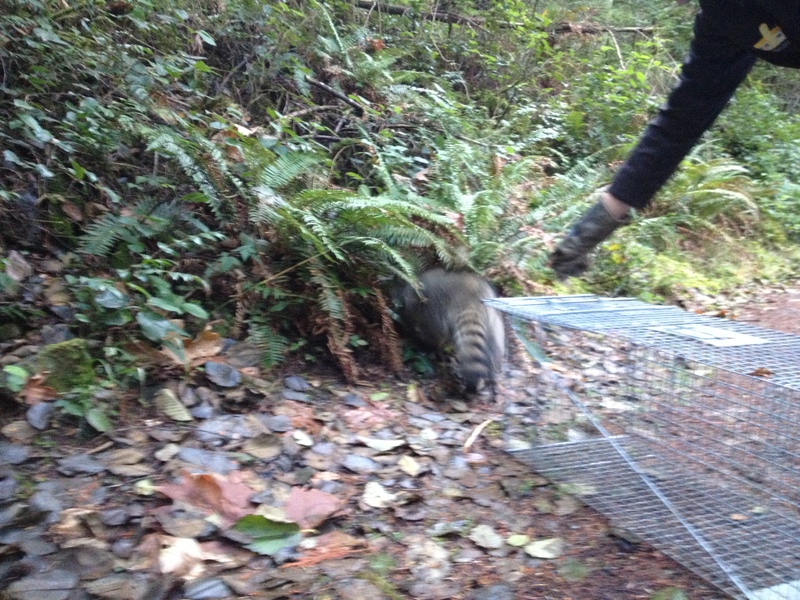 He was moving fast when he exited the trap, but we had released him at the bottom of a huge, forested hill and he didn’t get very far before he was huffing and puffing and had to stop for rest. He turned to look down at us and we wondered how he would fare out in the wild without easy access to a steady supply of ferret food. Then we decided he was carrying so much flab he probably wouldn’t have to eat all winter and he’d still be fine by the time spring rolled around. By which time he had caught his breath and continued on his way, disappearing into the trees, no doubt in search of a good place to have a nap. This entry was posted in Blog, Uncategorized and tagged 30 Day Farm Blog challenge, farm life, ferret, homestead, live trap, predator, raccoon. Bookmark the permalink. Thanks! It was great to see him ambling off into the bush – may he live long and prosper! I have no sympathy for raccoons. They have killed too many of our birds over the years. They are cute, but awful animals. Agreed… cute but awful. Very glad we caught this one. I’m also quite relieved it took the easy road and just stole the ferret food (and, likely, some cat food as well – I couldn’t believe how much the cats have been eating lately…) Several years ago we lost some beautiful ducks to a raccoon attack. Not good. We have much more secure housing for the birds now, but a seriously determined raccoon can break into places you’d never believe they could get into! Glad you caught him. We had an opposum popping heads off of chickens and turkeys.. Caught him in the act too using a live trap. We have a raccoon that frequents. He takes feed pans out of the barn and scatters them throughout the yard. He also pokes tiny holes in eggs and eats the inside leaving the shell whole and intact. Thank you for reminding me we are not the only ones.